This year's baby name craze is ... Instagram filters? Aww, lil' X Pro II is taking their first steps! Baby names have a variety of origins. A child could be named after a grandparent, a dear family friend, a shared experience, a favorite book, or whatever was drawn from a hat. This year, we can add "mommy and daddy's favorite photo setting" to the list, as Instagram filters are among 2015's top baby name trends. After analyzing a list of top names for newborns, BabyCenter noticed a theme among certain names increasing in popularity. While names like "Sophia" and "Jackson" were the year's most popular name among girls and boys, respectively, the study also noticed a rise in names shared with Instagram's photo filters, such as "Juno," "Ludwig" and "Valencia." 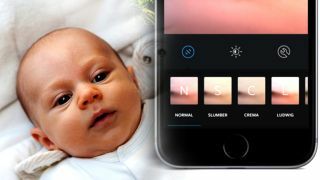 "This year, millennial moms and dads called the shots," said BabyCenter, pointing out that "Lux," taken from Instagram's ISO-esque exposure feature, rose in popularity by 75%, while "Amaro," a filter that's particularly good at making colder colors pop, rose 26%. Other trends of note included young adult novel protagonists, celestial bodies, royalty, and even video game heroines, with names like Jill (Resident Evil), Kat (Gravity Rush), Jade (Beyond Good & Evil), Joule (ReCore), and Meryl (Metal Gear Solid) trending.